No other region in the country has shown the tenacity to pursue a streamlined permitting process the way we have in Northeast Indiana. Designed and facilitated by the HPG Network and convened by the Regional Partnership, we brought together our region's 11 member-counties to form The Permitting Excellence Coalition (PEC). The PEC’s determination to streamline permitting processes across the region gives Northeast Indiana a competitive advantage in attracting new businesses and encouraging growth at the region's existing businesses. Streamlining is making a positive impact, and that’s always good for business. With a focus on customer service, transparency and ease, the PEC continues to grow as we add new jurisdictions. In 2011, the Regional Opportunities Council (ROC), the investor board of the Northeast Indiana Regional Partnership, voted Streamlined Permitting as one of the seven priorities in Vision 2020. This priority has been moving forward due to the collaborative work of Vision 2020 staff, ROC members and the HPG Network, as well as regional jurisdictions and process owners working as a unit to strengthen their processes. Dr. Andy Downs of the IPFW Mike Downs Center for Indiana Politics shared results to date from the customer service survey he is conducting. The group also had the opportunity to work with the Permitting Taskforce to discuss marketing materials they’d like to see created by the Northeast Indiana Regional Partnership to highlight the work they’re doing and the impact they’re having on the business development efforts in our region. Kate Virag, VP of Marketing & Strategic Communications, Jaclyn Goldsborough, Communications Manager & Rachael Driscoll, Graphic Designer worked with the group to determine what will be developed to tell the PEC’s story in 2018. Dr. Andy Downs of the IPFW Mike Downs Center for Indiana Politics has offered to review customer service data the PEC is collecting. He will contact & survey customers from the PEC over the previous 2 years and will additionally review all data submitted by the PEC from 2017. The data collected will be used for continuous improvement and to help tell the PEC’s story. The group also had the opportunity to participate in a panel discussion about communication with regional leaders specializing in how to communicate with and engage external stakeholders. Stephen Bailey, CEO of PH Digital, Bonnie Blackburn-Penhallow, Director Communications at Visiting Nurse, Pone Vongphachanh, Public Affairs Officer of UPSTAR Alliance of Realtors and Courtney Wagner, Marketing Director for Mike Thomas & Associates participated in the panel discussion and gave the PEC a lot of good ideas that they can take back to their jurisdictions. The PEC participated in two panel discussions with regional leaders about the role streamlined permitting plays in business attraction and quality of life efforts around the region. Chad Kline, Executive Director of Wells County Economic Development Corporation and Hannah Stork and Sarah Rodriguez, Directors of Business Development with the Northeast Indiana Regional Partnership spoke about how streamlined permitting impacts their work and how they might work more closely with the PEC in the future. The group then had an opportunity to speak to Zach Kinder of Michael Kinder & Sons, Anthony Goodnight of the City of Huntington and Michael Galbraith, Director of the Road to One Million with the Northeast Indiana Regional Partnership on how their work directly impacts the Road to One Million projects going on across the region. Andy Downs, of the Mike Downs Center for Indiana Politics has offered to review customer service data and reach out to customers who did not have an opportunity to complete one of the PEC’s customer service surveys. The data Dr. Downs compiles will be used to further understand the impact of the PEC and where continuous improvement efforts may need to be focused. The Permitting Excellence Coalition was recognized for their work in 2016. Representatives from the Northeast Indiana Regional Partnership, the Permitting Taskforce as well as elected officials and local economic development professionals from around Northeast Indiana came together for the ceremony and corresponding reception recognizing these dedicated and hard-working public servants. PEC members met to review the 2016 process metrics captured by each jurisdiction. Attendees completed a worksheet to assess if there was correlation between any of the variables identified last year correlated with permit timelines exceeding 30 days. The group determined that an incomplete application was the only variable that made an impact on this timeline. The PEC met for their first meeting in 2017 to establish their priorities for the year. This year, they will work on continuous improvement, engagement, outreach and involving additional departments who participate in the plan review process. The PEC is continuing to collect process metric data and customer service data, which they will review throughout the year. The PEC and the Permitting Taskforce met to discuss the Customer Service Survey and made any last minute modifications before implementation in January, 2017. The PEC also plans to use their existing process maps to track non-residential projects from application through issuance prior to their next meeting in February, 2017. In September, the Permitting Excellence Coalition (PEC) worked on process tracking and the customer survey, which will be released in 2017. To learn more about the progress of the PEC, check out an article from the Greater Fort Wayne Business Weekly highlighting the PEC’s survey efforts. The PEC met in June to discuss the customer survey tool and document the time and process in which it takes to get a typical permit. The PEC is tracked this data through the end of the 2016. The City of Wabash joined the PEC. The Regional Opportunities Council (ROC) voted to provide $30,000 to fund this Vision 2020 priority. 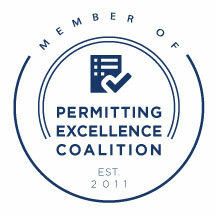 The PEC developed a plan to better engage business leaders that regularly obtain permits. The group also restructured the meeting schedule to give members the opportunity to share what they’ve been working, get the taskforce’s feedback, answer questions, and then build on that that feedback. The PEC added three new jurisdictions to the group including Wells County, the City of Rome City and the City of North Manchester. The group also set their priorities for 2016, which focused on transparency, customer service, process improvement, and engagement. The PEC was recognized with a plaque presentation reception for their work in 2015. Many of the region’s mayors, commissioners and local economic development professionals attended the celebration. The PEC mapped out the permitting process for a standard sized commercial project to share and compare results. The customer taskforce then discussed improvements on the process. The PEC assessed a recent customer feedback survey, analyzed results, and discussed how to improve the customer service survey for future use. The group also worked on processing improvements by developing a mock project to compare project timeframes in each jurisdiction. Regional elected officials and permitting professionals were invited to a breakfast to highlight the work of the PEC and to encourage participation from new jurisdictions. Participants heard about progress from their peers, as well as the value of participating. The PEC also had their first opportunity to meet directly with a new customer taskforce to get feedback on their work. The PEC established 2015 performance goals and discussed how to best incorporate the Vision 2020 Permitting Taskforce so that customers and process owners can work together on key issues. Representatives from the nine participating jurisdictions in the PEC were honored with a luncheon to celebrate their progress in the core values of consistency, transparency, and easy access. The group developed a streamlined and standardized permitting page for their websites; attended customer service trainings provided by the High Performance Government Network (HPGN), which was contracted by Vision 2020 to assist with the priority; and outlined their current permitting processes. Jurisdictional process owners and the High Performance Government Network (HPGN) developed state process maps for jurisdictions that did not have them in place. The maps were reviewed and revised. The group discussed the accomplishments and benefits of their work over this year and how the jurisdictions can work on continuous improvement moving into the future. All participants found value in the process and on average gave it a 4.9 out of 5 success rating. Representatives from the High Performance Government Network (HPGN) traveled across the region in August to work with the jurisdictional process owners to complete current state process maps. The High Performance Government Network (HPGN) provided customer service training to zoning and planning staff from Whitley County, LaGrange County, DeKalb County and the City of Auburn. The Permitting Excellence Program (PEP), made up of the nine jurisdictions participating in the streamlined permitting process, met to determine the content of upcoming customer service trainings. The group also worked together to identify their significant customers and to standardize customer service performance goals. Vision 2020 hosted a Permitting Excellence Workshop, where participants worked together to identify immediate actions and long-term goals related to strengthening the permitting processes currently in place in the region. The Vision 2020 staff and the High Performance Government Network (HPGN) met with local elected officials and process owners throughout Northeast Indiana to discuss the possibilities for strengthening existing permitting standards with a regional framework. The Regional Opportunities Council (ROC) voted Streamlined Permitting to the second highest priority of all Vision 2020 priorities and committed $25,000 in funding to advance the priority. Vision 2020 convened the Permitting Taskforce to act as an advisory group to the permitting priority and champion the activities of HPGN and Vision 2020. The Regional Opportunities Council (ROC) voted Streamlined Permitting as a top priority in the Business Climate pillar as part of Vision 2020. To support the priority, the Regional Partnership entered into a formal contract with the High Performance Government Network (HPGN), a non-profit organization concentrating on government-focused consulting and collaboration. HPGN started its work by reaching out to the 17 largest jurisdictions in Northeast Indiana to begin building productive relationships. The High Performance Government Network (HPGN) surveyed interested jurisdictions in the region about their permitting processes. HPGN identified strengths and weaknesses that could provide a competitive advantage over other regions in business attraction and retention. HPGN also identified three core customer values: consistency, transparency, and easy access.